Thraedable, a social enterprise, is opening a pop-up shop and exhibition at 44 Ashdown Crescent, NW5 on Sunday 14th January 2018, to run until the end of the month. The shop will also host an exhibition of art made during Thraedable workshops in Tunisia, Greece & Italy with refugees and disadvantaged youth. Please support this! 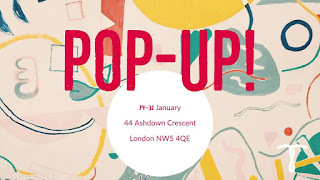 "On 14th January, Thraedable, a social enterprise, will launch its first pop-up shop and exhibition. In an empty property in 44 Ashdown Crescent within the Borough of Camden, Thraedable’s pop-up will tell stories to reshape narratives on refugees and other social groups left at the margins of society through fashion and art. Thraedable is an emerging social enterprise with a vision of a world where everybody has a voice, where everybody’s rights are respected, and where sustainability is the norm. Guided by this mission, Thraedable partners with grassroots charities around the world, holds art workshops with their beneficiaries, and takes inspiration from their artistic creations to design organic clothing items that tell a story. 50% of gross profits from the sale of each item is shared with the partner charity that helped inspire it, so that each purchase directly contributes to their social projects. In addition to selling Thraedable’s ethical and sustainable first collection, the shop hosts an exhibition showcasing the drawings made during the art workshops that Thraedable held in Tunisia, Greece and Italy with refugees and disadvantaged youth. Visiting the shop is thus a memorable experience through which visitors can learn about little-known social issues in different contexts as well as about sustainability and social consciousness in the fashion industry. Cristina Orsini, one of Thraedable’s co-founders, personally runs the pop-up shop to provide visitors with answers to any questions, from the manufacturing process to the stories behind each product and each project. Thraedable’s pop-up shop is part of the Camden Council’s Pop-up Shop Project to temporarily fill empty properties while giving artists and creative start-ups an affordable space to display their projects to new audiences - an invaluable opportunity in a city like London where rent makes shops inaccessible for independent and emerging creative projects. Thraedable will host a launch event on Sunday 14th January, 6pm-8pm."